e-CAM50_CU9P031_MOD is a 5 MP custom lens monochrome camera module based on Aptina's MT9P031 CMOS image sensor with S-mount lens holder attached to it. 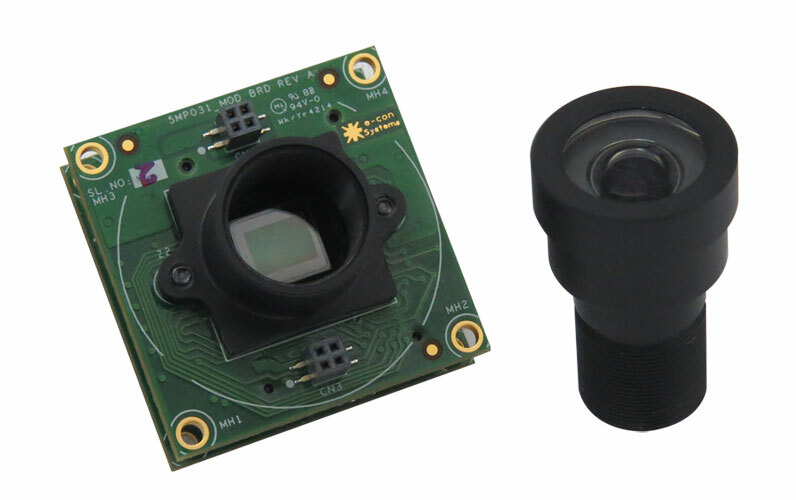 The MT9P031 is a 1/2.5" Optical Form factor, Electronic Rolling Shutter CMOS sensor. 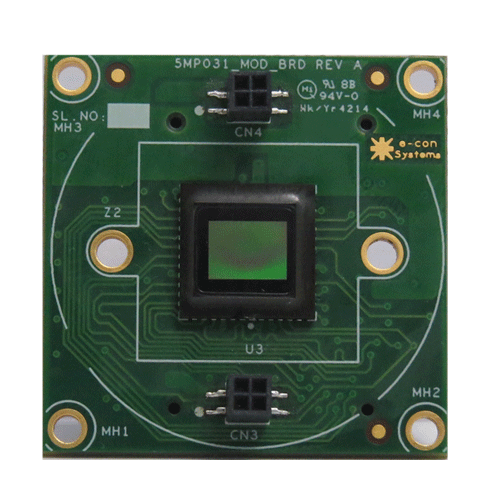 The e-CAM50_CU9P031_MOD is designed to connect with any Application Processor that has parallel digital video interface. The standard S-Mount lens holder can accommodate a wide range of lenses based on the customer choice. e-CAM50_CU9P031_MOD’s S-Mount holder can also house a fisheye lens or a zoom lens to meet their application requirements. Sensor Lens Size - 1/2.5 "
MT9P031 - 5.0 Mega pixel CMOS Monochrome Image sensor from Aptina. The USB 3.0 Camera Board, See3CAM_CU51 can be bought by customers choosing to evaluate the e-CAM50_CU9P031_MOD camera module. Customers who own platforms that support SuperSpeed USB 3.0 port can directly buy the See3CAM_CU51 from e-con Systems. In addition to See3CAM_CU51 - USB3 Camera, the evaluation kit comes with e-CAMView - Windows sample application for video preview and still capture along with the UVC Extension features (for Windows 7, Windows 8/8.1 and Linux&) or QtCAM - sample application for video preview and still capture along with source code (for Linux). ACC-CX3RDK-CU9P031 is an Add on board to Denelola – CX3 RDK to evaluate e-CAM50_CU9P031_MOD, a 5 Mega pixel camera module based on MT9P031 image sensor. This Camera comes with S-Mount lens holder mounted over the sensor. This allows various compatible M12 lenses to be used with USB3 Monochrome Camera. Also for customers choosing to use C/CS Lens, there is a provision for connecting C/CS mount Holder, enabling them to replace the S-Mount holder.